I just picked up a mostly complete set of Greist top clamp attachments at a thrift store today. The slot where they attach to the presser bar is only 1/8" wide. Any idea which machines they might fit? I don't think I currently own any machines that use them but at $2 I wasn't going to walk away either. I've already kicked myself for that on other attachments I didn't have machines for. gap .127. height .523, gap to needle hole .475 with toe open - right offset - this set is also called "universal" since it has an larger, open ended needle "hole". The big different in these is the gap to needle hole measure, though it can be difficult to measure on the foot. I measured this on the machine - from the front of the clamp to the needle. I'm sorting and getting things figured out and then will offer the rest for the cost of shipping. I counted, I've got over 60 sets of top clamp attachments, though I expect I'll be keeping well over half of them. And - I have at least two sets that don't quite fit any of these machines. Side clamp are so, so much easier to deal with! When my mother gave me her Singer 15-91, she gave me all the attachments she had. So when I got home with it (she was in Seattle area and I live south of San Diego) I was spending a day re-learning the machine, the button hole maker, the zig zag maker, and all the little pieces - but one box of items just didn't work -no matter how hard I tried, I couldn't get them attached. Called my mother to find out how what I was doing wrong. She said it was something her mother bought and she had no idea how to use them. My grandmother never sewed anything except maybe mend a seam or hem. So when I looked closer at the attachments, and there on each one was a "W". I may have 7 sewing machines, but none of them are a "White" and not of them can use the attachments. So even though it is against my up-bringing, the box of attachments went off to a thrift store. I suspect these attachments are for a VS type machine but are somewhat newer because the ruffler and zipper foot have plastic screws. I may have one VS machine that takes top clamps. It's buried in storage right now and I've only seen it once in about the last 5 years so I don't currently remember the brand or the foot style. I'm going with the idea that these may fit. If they don't I'll have to find the correct machine for them. BTW - did they come in a cardboard box instead of a metal tin? Most of what I have are older than the vintage where Greist started putting them in cardboard boxes. Also - many of the sets from the time plastic screws were used do not include the tucker as a standard item. I think near the end of the top clamp era, Free/New Home and White may have been the only two left. Thanks for taking the time to measure Cathy. A handy tool you have given us. When I get a bit more time, I'll do up the whole list with pictures. It's rather amazing at all the different sets out there. There weren't that many companies that made them. I guess they just liked to change things every year or so to keep it looking "new and different". I've got several really strange attachment type feet - I'd consider them a precursor to the Top clamp in that the attachment point slips on the round presser bar like the top clamp part does (the part the top clamp feet fit into). I'll be going through my "not top clamp or side clamp" feet next, and this includes the bed mounting sets. Then I'll go through my Non-Singer side clamp sets. oh - and Rodney - if you have an adjustable zipper foot, you have one of the last of the Top Clamp group. Give me a little bit and I'll get you a picture. I don't know enough to know if everything belongs in the box or not. The first picture is everything I got. There is what looks like an edger that attaches to the bed of the machine on the right side in the first pic. There's also what looks like a combination edger/braider right below it. The second picture I'm trying to show two feet that look like gathering feet but one is longer than the other. From the front of the gap to the needle hole measures pretty close to .5 inches. I think that would make them for the newer style Free/ New Home machines. EDIT: I forgot to add. What a mess to sort through with all the different styles of attachment and spacing on the needle holes. My hat's off to you Macybaby for being able to put together your collection and information on these feet. Especially given the quality of pictures and info you get from your typical Ebay sellers. Are you sure it's the narrow slot? I don't think Kenmore sold any other top clamp machines other than those made by White and White has the wider slot, closer to 3/16" instead of 1/8". Unless you just mean it has the top clamp attachment, then I can assure you the Kenmore fits the White (and Domestic made by White) machines. This is a later set, one that would not have included the Tucker or Underbraider. And for sure this fits Free/New Home, the shirr plate is the easiest way to tell. The last two, the one is the Quilting foot, and would be used with the quilting guide taht fits into a hole in the presser bar. The second is the Gather foot. You sew on one layer of fabric and it will pull it into a ruffler behind the foot. It's not the same as the Ruffler which will do a uniform pleat, this is like what you get when you loosen the top tension and then pull the lower thread to gather the fabric. The main difference is this foot allows a "lock" so if you use it, you won't be able to adjust it as the thread won't slide like when you loosen the tension. Ebay sellers rarely know what they have, and I've seen a lot of "sets" that are a collection from several machines. Looks like they're selling them by the pound, not the foot. I just bought an older machine and it came with a set of the top clamp greist attachments like you've shown here, also without a way to attach them. Did you ever find a way to attach them? Does your machine take side clamp feet? If so, then there is no way to attach these. It's not uncommon for feet to get paired up with a machine they don't belong to. 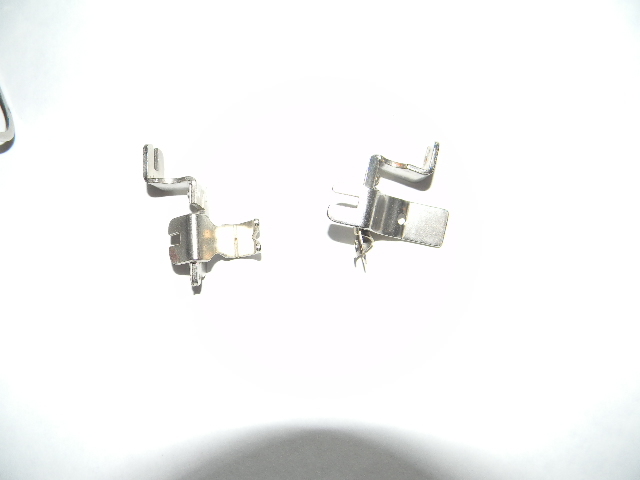 There is a wide variety of top clamp feet too, and for the most part they are not interchangeable. Side clamp presser bars have a flat side, and the top clamp attachment fits on a round presser bar. I believe Free/Westinghouse is threaded, but I'd have to go look to be sure. I know one of them is. Last edited by Macybaby; 11-15-2014 at 03:16 PM. That adjustable zipper foot is the best thing ever made. If something were to ever happen to mine, I would lose my mind. These newer ones are garbage. What is a VS machine? This information about what to call the way feet attach is exactly what I was looking for! VS is Vibrating Shuttle - it has a long shuttle/hook that moves back and forth instead of a round shuttle/hook that moves in circles (either all the way around (full rotary) or back and forth (oscillating, like a Singer 15). VS machines come in two basic types - those that go back and forth, and those that go side to side. Typically the side to side are older machines, often with "boat" shuttles instead "bullet" shuttles. As to Feet - often the feet between a Mfg VS and Rotary machines are interchangeable, but not always. 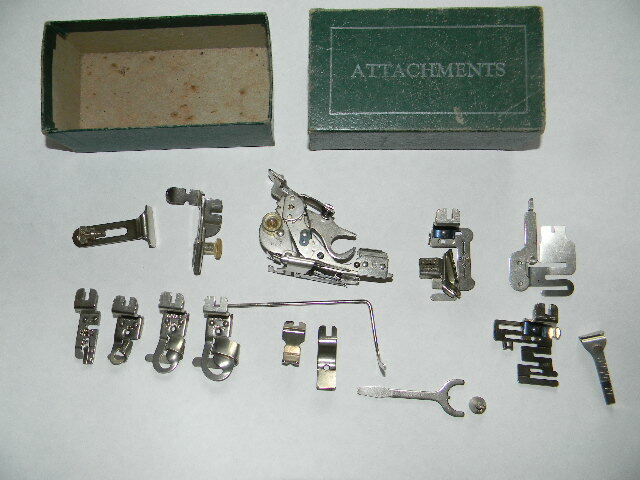 However bed mount items (like the shirr plate and underbraider) are often unique as most of those for the VS machines are hooked to a plate that slides in place of the front throat plate. Last edited by Macybaby; 11-19-2014 at 10:18 AM. Wow! I have a LOT to learn. I'll have to pile up my 'random' feet/attachments and see what's what. Wow! I have a LOT to learn. width of top gap (basically 1/4" or 3/16") then the height, and then the distance from the front gap to the needle hole (this is most often 1/2" or 5/8") and then look closely to see if the needle hole is centered in front of the gap, or offset to the left or right, and if it's a large offset or a slight offset. BTW - there are sets that don't have a closed needle hole in the hemmers/binder. I refer to them as "open toed" feet, have no idea if they have an official name. Oh, yes, you're right - so much more to learn that I don't even know where to start - I need pictures! But then I kept acquiring faster than I had time to catelogue. but not the rest . . . over half of these are top clamp, and most are different from each other in some way, and some are partials I need to combine to make a complete set. And with the snow and cold, not much progress has been made on my Machine Shed for a while. Should be warming up enough to get out there this weekend. Last edited by Macybaby; 11-19-2014 at 08:27 PM.